The breaking of the 70th seal of the Roboplastic Apocalypse is a virtual convention panel catastrophe that you can enjoy! 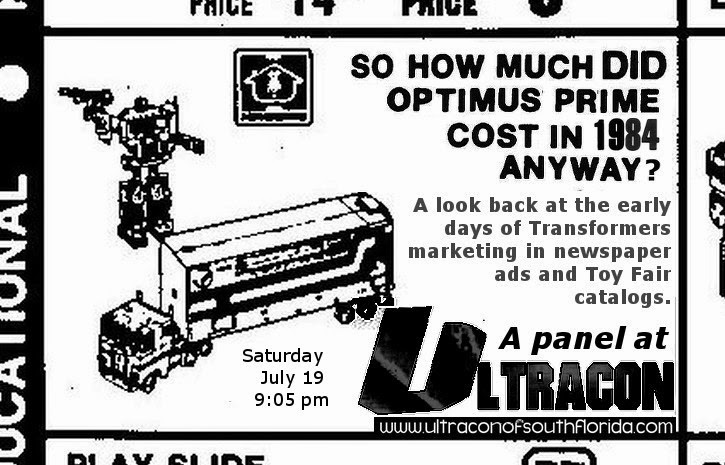 Yes here is the entire slideshow I created for a panel presentation that set out to answer the most often asked of vintage Transformer pricing questions-So how much did Optimus Prime cost in 1984 anyway? Listen in terror and follow along with the slides as I go over a greatest hits of the Vintage Space Toaster Palace Transformers 1984 edition in search of the answers to unknowable toy robot truths found buried in microfilm rolls of 30 year old grocery store newspaper ads previously only gazed upon by little old ladies and vagrants and vagabonds bored to death at a public library near you. Why were newspaper ads better than department store catalogs? Were there more retail stores today or 30 years ago? And which Transformer was more than meets your mouth? Find out all that and more in this THE NEXT BEST THING TO BUYING THERE edition of the podcastalypse! I want to thank my fellow Macrocranian Juan T. for taking the time to listen all the way through and claim the Pablo Marcos signed copy of "Satellite of Doom"
IN ROBOPANEL APOCALYPSE, PANEL GOES TO YOU! Well the first ever Roboplastic Panelocalypse went exactly as I figured it would. I signed up to do a panel at a local convention and I asked to be scheduled for Sunday morning and I requested a projector. I ended up getting scheduled for late Saturday night and got no projector. Apparently my topic was so insanely boring that even the equipment did not want to come to my panel. Well I was okay with the schedule change to a time when everybody was going home because who needs an audience really, but the lack of equipment preparedness on the part of the organizers is what did me in. So with no people in the audience and no projector to do my presentation I just said screw it and I left. But there was no way I was going to let all those late nights I stayed up working on those 40 powerpoint slides of toy robots grocery store ad hell go to waste. So here in all its glory is the presentation that I would have bored you to death with had you been in attendance in convenient podcastalypse form so that you can bore yourself to death with it at your own leisure. You can either follow along using the built in slideshow function by clicking on the first slide below, or you can get all these slides as a powerpoint presentation. It's just like not being there! I planned to give away a signed copy of Satellite of Doom to my panel audience but since they didn't show up I gave it away to the first person to make it all the way through this episode! Much to my own shock and amazement (and I'm sure to that of my audience as well) the convention organizer of Ultracon thought it would be a good idea to give me an hour to talk to the assembled Cybertronian masses at the Ft. Lauderdale Convention Center this weekend about my favorite Transformer continuity, which is old newspaper ads from K-Mart and a couple grocery stores in Texas. And although my actual Fort Lauderdalien audience will most likely be two passed out drunk guys, I know that you, my fellow Macrocranians, will probably want to hear the entire one hour robotarded aspergian nightmare unfold so I will attempt to record the panel for your listening enjoyment and release it as an upcoming episode. The breaking of the 69th seal of the Roboplastic Apocalypse unleashes a tsunami of epic roboconversations all over Miami Beach on Fourth on July Day 2014! Like Tubbs to a Crockett, mighty waves of comic bookers, my little ponyers, powerful rangerers, video gamers and other assorted japanamation strangers all converged on the Miami Beach Convention Center for Florida SuperCon! Join the Nostrodomatron as I surf the waves of pop culture nerdity in the hopes of landing on conversation islands with the artists who helped create the great toy robots comics of the 70s and 80s. How did Al Milgrom get lucky enough to edit Shogun Warriors, Micronauts, and ROM? Why did Joe Rubinstein leave the Micronauts? And how did Peter David come to the realization that R5-D4 singledroidedly saved the Star Wars galaxy? Find out all this and more in this TALKING NAUTY IN MIAMI edition of the podcastalypse! This picture with Josef Rubinstein and Al Milgrom was a highlight of the con, but listen to me talk about why it also drove me crazy! I don't know what character that pumpkin is, but it would have looked awesome on stage with Helloween back in '88. A couple booths had nice selections of American Toy Robots of Japanese Toy Robots, and one even had Robo Force! I met the lead accordion player (?!) of the band Random Encounter, saw Robert the oldest robot at the con, and talked to Peter David about Skippy the Jedi Droid! Al Milgrom was a great guy and gave me an absolutely fantastic interview. Joe Rubinstein was really classy and professional and made me wish I was, too! It isn't a legit Florida comic convention without the legendary artist José Delbo! Danny Fingeroth was really cool about the whole Robot Master thing! He even dedicated his book to me with "Your pal, Donny Finkleberg"! It's time for Florida Supercon 2014! Last episode is the pre-show to this episode! The lost Peter David Transformer story "The Love Bug"
The Marvel in the 80s panel with (from L-R) Peter David, Danny Fingeroth, Bob McLeod, Al Milgrom, Alex Saviuk, and Greg LaRocque.